This is sixth part of my RAC lab series. I will show you step by step how to prepare your OEL 7.x OS for GI and RAC installation. VM with OEL 7.2 in part 3 of the series will be used to show this. If oel72rac1n1 VM is not running please start it using vboxmanage in the cli. Before I do anything with the OS, I need VM’s network to be functional. Let’s check with vboxmanage showvminfo what kind of interfaces we got for this VM, and what they MAC addresses are. So now as I know that I need to get IP from dhcp for bridged interface I take MAC address of the bridged interface (0800276A189E) and register a static IP for it in my DHCP server (192.168.1.21). First we need to remove incorrectly configured connections – done by the installer. [maciek@oel72rac1n1 ~]# sudo nmcli con add con-name storage-internal ifname enp0s8 type ethernet ip4 "192.168.10.21/24"
[maciek@oel72rac1n1 ~]# sudo nmcli con add con-name priv1-internal ifname enp0s9 type ethernet ip4 "192.168.20.21/24"
[maciek@oel72rac1n1 ~]# sudo nmcli con add con-name priv2-internal ifname enp0s10 type ethernet ip4 "192.168.21.21/24"
[maciek@oel72rac1n1 ~]# sudo nmcli con add con-name apriv1-internal ifname enp0s16 type ethernet ip4 "192.168.30.21/24"
[maciek@oel72rac1n1 ~]# sudo nmcli con add con-name apriv2-internal ifname enp0s17 type ethernet ip4 "192.168.31.21/24"
It is good to perform some basic test now. First let’s try to ping some url on the internet and then openfiler1 interface on the storage network. PING onet.pl (213.180.141.140) 56(84) bytes of data. We will get back to the network configuration later, but now let’s add some software to the system. Remember, we have installed just the minimal software pack for the system, we lack some packages required according to the oracle documentation and some others that can be useful. There is no installed groups file. What we generally need to install is the base group – a lot of packages are installed by this group. Update whole OS, the update process will update packages and linux kernel. We got what we expected. vboxuser1@macieksrv.dba24.pl ~ $ vboxmanage modifyvm "oel72rac1n1" --name "oel7rac1n1"
Start up VM again after the modification. With the repository in place you can install rlwrap using the following command. Connecting to www.mirrorservice.org (www.mirrorservice.org)|212.219.56.184|:80... connected. Userid     : "Fedora EPEL (7) <epel@fedoraproject.org>"
Rlwrap has been installed successfully! “As mentioned in Section 1.2, “Some terminology”, the Guest Additions are designed to be installed inside a virtual machine after the guest operating system has been installed. They consist of device drivers and system applications that optimize the guest operating system for better performance and usability. Please see Section 3.1, “Supported guest operating systems” for details on what guest operating systems are fully supported with Guest Additions by VirtualBox. 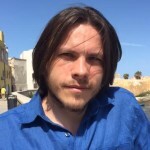 vboxadd.sh: Building Guest Additions kernel modules. vboxuser1@macieksrv.dba24.pl ~ $ vboxmanage showvminfo "oel7rac1n1"
lis 17 16:43:44 oel7rac1n1 vboxadd-service: vboxadd-service.sh: Starting VirtualBox Guest Addition service. lis 17 16:43:44 oel7rac1n1 vboxadd-service.sh: VirtualBox Guest Addition service started. lis 17 15:43:45 oel7rac1n1 systemd: Started vboxadd-service.service. Dns names resolving configuration is very important for RAC to work properly. You need to take the most care of the SCAN addresses – they have to be available from a dns server. As far as I know other addresses can be resolved locally. Grid Installer checks if dns is configured properly so this is a mandatory step. Next change /etc/dnsmasq.conf by adding the line for resolv-file option pointing to the externalDNS file. gru 02 13:59:46 oel7rac1n2 systemd: Started DNS caching server.. Beautifully, works like a charm!!!! lis 17 16:06:16 oel7rac1n1 sshd: Server listening on 0.0.0.0 port 22.
lis 17 16:06:16 oel7rac1n1 systemd: PID file /var/run/sshd.pid not readable (yet?) after start. lis 17 16:06:16 oel7rac1n1 systemd: Started OpenSSH server daemon. lis 17 15:43:57 oel7rac1n1 systemd: Started Dynamic System Tuning Daemon. lis 17 16:18:59 oel7rac1n1 systemd: Stopped Dynamic System Tuning Daemon. For virtualbox the time is provided by Vbox Guest Additions, but in order to install Grid Infrastructure we need NTPD to be running or CTSS cluster service configured. I choose to disable NTPD and use CTSS, because I have no time servers configured on the VB Host (my ubuntu machine) and I don’t really want to play with it. Unit ntpd.service could not be found. Firewalld needs to be stopped in order to not to interfer the cluster communication. There are tutorials how to keep it, but for lab this is not necessary. lis 17 15:43:47 oel7rac1n1 systemd: Started firewalld - dynamic firewall daemon. lis 17 16:43:26 oel7rac1n1 systemd: Stopped firewalld - dynamic firewall daemon. Disable transparent hugepages. First check current settings. CFQ is set by default. In order to enable deadline scheduler we need to tweak grub. Remember: do not change /etc/grub2.cfg file, because it is automatically generated by grub2-mkconfig using templates from /etc/grub.d and settings from /etc/default/grub. Change /etc/default/grub instead. GRUB_CMDLINE_LINUX="crashkernel=auto rd.lvm.lv=ol/root rd.lvm.lv=ol/swap rhgb quiet numa=off transparent_hugepage=never"
GRUB_CMDLINE_LINUX="crashkernel=auto rd.lvm.lv=ol/root rd.lvm.lv=ol/swap rhgb quiet numa=off transparent_hugepage=never elevator=deadline"
Backup current /etc/grub2.cfg file somewhere. After you have modified /etc/default/grub run grub2-mkconfig. Deadline io scheduler has been set successfully. The plan is to use HugePages for DB, but for ASM Oracle recommends Automatic Memory Management (memory_* params). To disable SELINUX modify /etc/selinux/config file. #   Access to this system is permitted only for authorized personel. #       All actions made on this system are monitored and logged. Then put following settings into this file, remember to tweak memory settings accordingly to the memory size of your VM or your needs. My VM has got 6GB of RAM assigned. I have met the opinion, each time you set HugePages you should reboot your server. I will do it as some really wise guys recommend it. 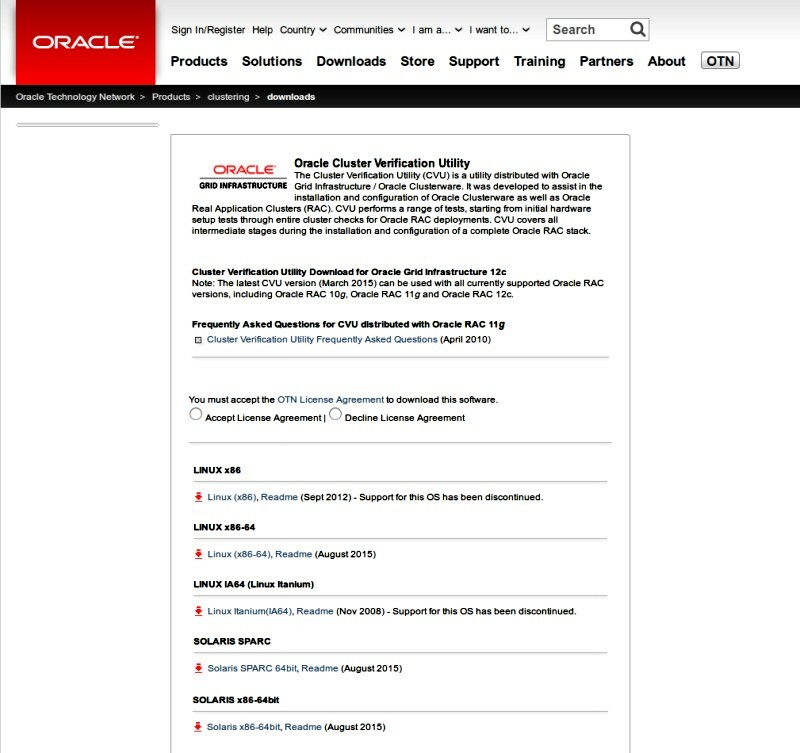 Create all the below groups on the Oracle database servers. Please keep the GID numbers, this is important to keep the standard in an environment. As you can see groups oinstall and dba have already been created by the oracle-rdbms-server-12cR1-preinstall.x86_64 package. We need two users for our installation – grid for Grid Infrastructure and oracle for Oracle Database sofware. I like this idea of roles separation and have been using it from the time this concept apeared with Oracle 11R2. As you can see below user oracle was created by oracle-rdbms-server-12cR1-preinstall.x86_64 package. As you can see in 7.2 RemoveIPC is set to now by default. We don’t need to change anything then. 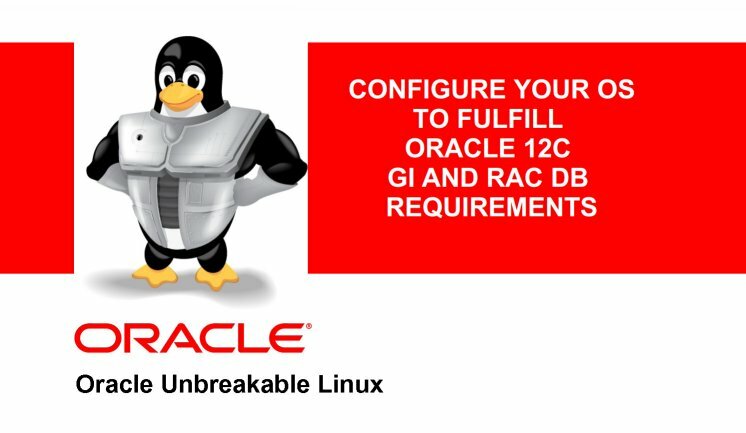 The OS is ready now for Oracle 12c. To be able to install GI and RAC db we need some iSCSI storage presented by Openfiler servers (openfiler1, openfiler2,openfiler3). Next parts of the series will guide you through the process of openfiler storage configuration, openfiler and rac node VM cloning. I will also show you how to present and attach iSCSI disks for RAC nodes.